A classic from Napoleon Hill, author of the classic and still applicable Think and Grow Rich (affiliate link). If you haven't read it, I highly recommend picking up a copy. As the book was written in 1937 one might think the lessons are out of date, but some things never go out of style. 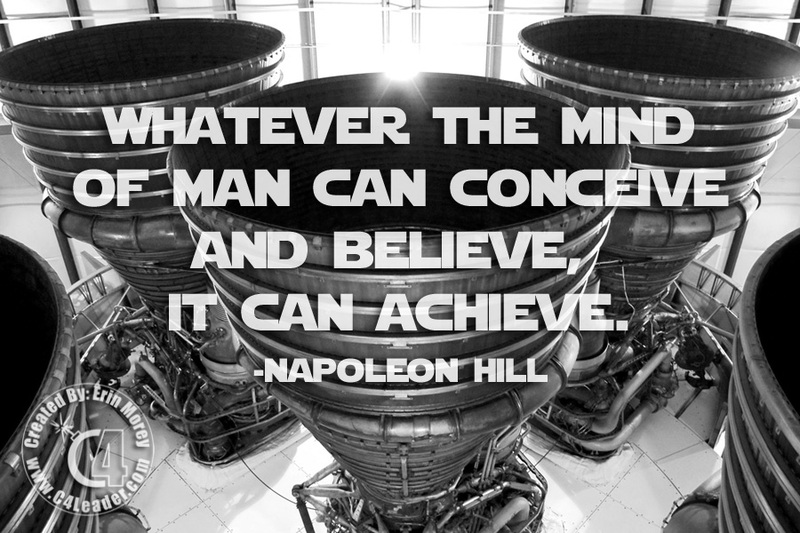 Whatever the Mind Can Conceive and Beleive, It Can Achieve. This is even more true today than in the 1930's. Computer systems, Artificial Intelligence, the wealth of knowledge on the Internet, 3D printers, all of these things were foreign concepts when this quote was first put to paper (let along a computer screen capable of being shared instantaneously around the world). As leaders often our job is to Conceive (one of the Cs in the C4 Formula) an idea, a dream. To give it enough depth, life, that others will believe in the dream and work towards accomplishing it. First, I believe that this nation should commit itself to achieving the goal, before this decade is out, of landing a man on the moon and returning him safely to this earth. John F. Kennedy Conceived a dream that inspired a nation and Communicated (yet another C in the C4 Formula) it clearly and often. Sadly he was assassinated prior to his dream becoming a reality, but a reality it did become. Before the end of the 60s, Neil Armstrong became the first man to walk on the moon and he returned home safely. So what can you Conceive for your team, or for that matter, yourself? What dream inspires you and them? Can you see the end state? Can you Communicate it with your team? Then you CAN achieve it!